By and large I try not to feel sad for people, but I do feel slightly sad for all those outraged at the appointment of Emery. The concept of a management team maybe putting together a job description, employing Headhunters, compiling a long list, inviting applications, holding interviews, possibly then moving on to a second set of interviews before making their final decision – and then the HR and Legal Teams working out exact details of contracts and remuneration before the decision is made public is clearly alien to them. That all this has happened seemingly so quickly – remember Arsene only announced his resignation a scant month ago – suggests to me that the process, far from being the panicked rush that some claim, has actually been carefully managed and orchestrated. Arsene’s announcement – the eloquent tributes already in place, the talk of the future and his replacement (and don’t forget all those other appointments made this year), the magic final match, celebrations and presentations, the secrecy since then, the poignant pictures of Arsene leaving Colney for the last time – and then only hours later the bombshell announcement from Ornstein. Impressive work, I reckon, and a sign to me that the club from Kroenke down have made some cold-blooded and logical decisions with the express aim of restoring Arsenal to its position as undisputed leaders of London football – and exceptionally well-placed to mount a serious challenge to all clubs, both English and further afield. Fins, it wasn’t necessarily the young players in the senior squad I was talking about it was the players below that. In the past it has been our decision in the main who stays and goes as regards youth players. There seems to be a growing trend, of players that we are putting alot of time and effort into developing, suddenly deciding to move elsewhere usually abroad. Sorry Ian I went on an Oxlade tangent: losing the kid to benfica and that family of agents was not ideal! Tapping ’em up younger and younger. Makes sense if you’re an agent. Just business for them. Emery will have to adapt to England. No winter break might need some heavy rotation, or adjustment to the pressing game he would normally coach. On top of that he’ll learn that Arsenal get more injuries for some unidentifiable reason. Though I maintain we won’t see the worst of that until we’re doing (too) well in the league. Anyone capable of reading the above has enough juice in the brain cells to be able to appreciate that Allegri was never a contender. It’s just the back line left really. The rest has already been done. Im impressed with everybody’s maturity here, acting so cool as if a new Head Coach is just another everyday thing. I had no idea what i was going to feel like when Arsene left and someone else took his place. I even wondered if i would want to bother with it all anymore. And yet here I am literally shaking with excitement and already forming a quite ridiculous attachment to Senor Emery. Funny FH, but I feel dispassionate about him. I’m not able to jump from AW to some ‘Johnny come lately’. I’m sure I’ll get there, but not yet. Talk is all well and good, but the proof of the pudding as they say is in the eating. I’d be lying if I told you I wouldn’t have had some concerns if Allegri was giving a press conference at The Arsenal today. I don’t need a translator or Timmy Payton or Stillman to ignore this paragraph in order for me to read or understand it. Still find it very hard to imagine this European super league or super-sized champions league coming to pass, but it seems pretty clear some powerful people want it. Good article here, though not a particularly cheering one. It all smells to me of the prospect of greed finally achieving it and damn near breaking football. Maybe it’s inevitable, but i still can’t picture it at all. Danny Fizman was far from perfect. A little bit like me then hehe. Our friend Frank had some choice words on the subject whe he was upset at the treatment AW was getting from the shriekers mob. But he was one hell of a negotiator. The club and our new manager were excellent today, as they have been throughout this whole process. The media really did not have a clue. A real sense of excitement at what is to come. Bad week , perhaps terminal week for the ITKs, no Allegri did a couple of them including that AFC Pug or whatever that kid is called, and no Arteta did one of the most boastful and obnoxious. We sat down with Unai Emery on Wednesday for his first one-on-one interview as our head coach. The Spaniard discussed a “grand opportunity”, what he wants from the team and working with Jose Antonio Reyes. 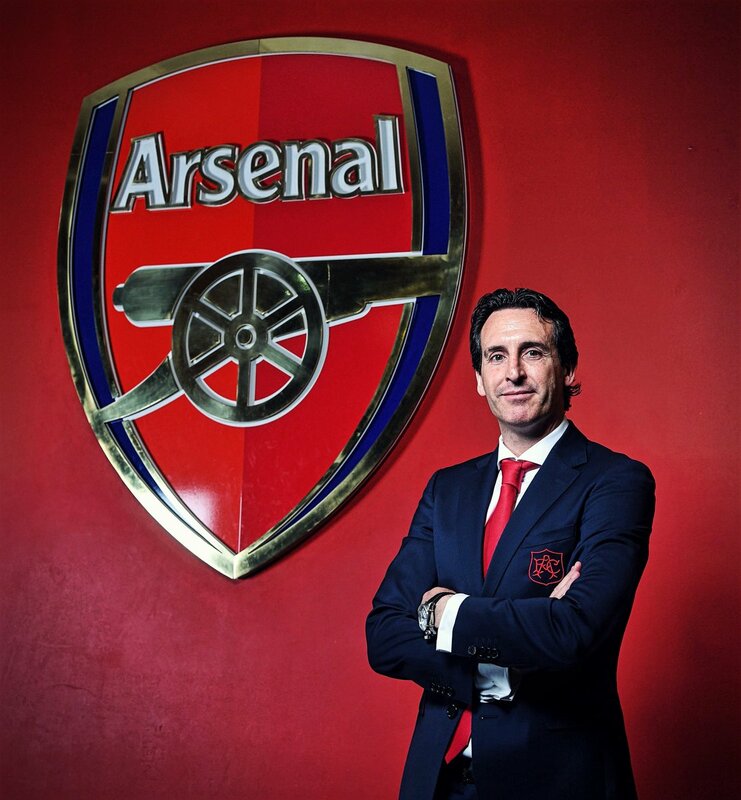 Unai, it’s a new chapter for Arsenal and a new chapter for you. What does it mean to you to be our head coach? I am proud of this opportunity. I’m very excited to start the new way together with this Arsenal project and my personal project also. I love the passion, I like the intensity, I like to find the way for next season. I am very, very happy to be here. When you hear the words ‘Arsenal Football Club’ what comes to your mind? A great club, a great city, a great set of supporters and a big stadium. For me it’s a dream to come true to work here. It’s a grand opportunity and a challenge. What message would you like to give to our fans on your first day here? I want to say to all the supporters that we are going to work hard. I don’t promise I will win, but I promise we will work hard. You’ve said before that “fans want their emotions to come to the surface”. How do you make that happen? For me, during my career, two things have been important: hard work with heart and thinking with the head. The combinations are very important. Think positively with emotion and intelligence. In terms of the current team, how much potential does it have? I love the talent and I think this team are a talented squad. I think, when you are talented, you need to work with that talent and find a great performance with the talent and with the work. so it seems Arsene Wenger is the last Arsenal First Team Manager, Unai Emery has been appointed Head Coach. The new model for running the team means no more First Team Manager, it is Head Coach who has a team above him doing a lot of the stuff the Manager used to do. some very interesting quotes from Ivan Gazidis on how the selection process worked, and how he, Raul and Sven came to their decision. “We went through a pretty wide-ranging discussion, challenging each other on as much as we could on preconceptions and assumptions we might have had going into the process. “By the way, all the way going through the process, Raul and I and Sven spoke to each other as little as possible. “Because we didn’t want to pollute each other’s viewpoints from the discussions we had had. We wanted to come to the discussion fresh when we had been through all eight of the finalist candidates. “We narrowed it down to three. We spent an entire day discussing among those three. “At the end of the day, three of us all wrote on a piece of paper, 1, 2, 3, and put them into the middle of the table. According to El Desmarque, Lucas Perez has been told to report back to #Arsenal for pre-season training on 2nd July. He views Emery’s appointment as ‘good news’ as Emery was interested in signing him in the summer of 2016. I like him, if not for any other reason that he and Ivan have already fucked the press and the ITK’s. Next is his love of Arsene and his 5-4 philosophy more things the wobs won’t like. Obviously the replacement plan has been going years not weeks again proving the press wrong. I just saw a photo of Emery sitting in the seats on the sideline. And I couldn’t help but think about Wenger and what a man he is. Those nice comfy, huge bucket seats. 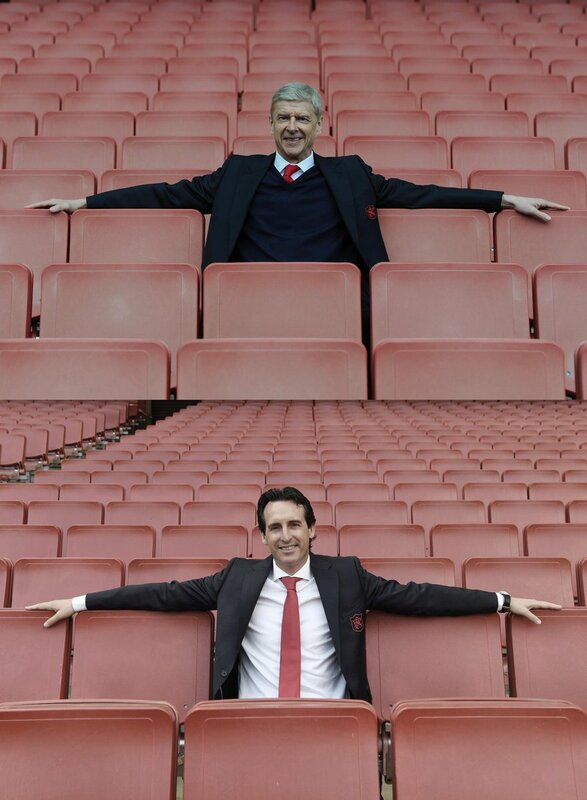 Those weren’t there when the Emirates stadium opened because Wenger wanted to sit on the same seats as the fans. I haven’t been able too watch all the interviews (any) with AW after his final match. I could write that time was the issue, but then I’d be lying. The fear was that Ivan wasn’t the person that AW has trained him to be (Ha! Ha. Heh.) and that very shortly the Italian Redknapp* would come bowling through the marble halls with his retinue. I have an active imagination. Fortunately the old gaffer slapped Ivan into shape years ago. (Just a poor joke! He was hired because he was the right man for the club) Ivan knows the defensive drills (boom boom!) and that’s why he started off that press conference with a confident statement and step into that forward defensive posture. The new manager doesn’t know much about the history of the club, but he knows all about AW. by the way, its seems English is his 4th language, a real successor to Arsene Wenger. It’s the new Doctor we’re safe now. < some people may not have felt comfortable with Hunter's statement that AW was more well known then The Arsenal in the world of Football, the new Head Coach's words are testament to that fact. << which is why he needs an equivalent to a pat rice to help him make that adaption that apparently even great footballers don't have to make it doesn't suit the fraying Narrative (they do!). Looks like Ivan done good so far.